Difficult choices about buying food – I think we all have them these days. I would like to buy local – but I live in a desert. Nearer doesn’t always mean best. Take lovely fresh bunches of local herbs; they disappeared from our shelves temporarily a few months ago due to toxic levels of chemical being detected. It makes you wonder what’s not detected. On the plus side, there is a small farmer’s market once a week during the cooler months of the year but the range is naturally limited. Eggs are a quandary. Local means battery farmed from ominous looking sheds that line the back roads of the Emirates. Organic, free-range means air-freighting, food miles, a compromise on freshness, not to mention the price. Even home-grown herbs and tomatoes, which I plant every year, use imported potting soil and desalinated irrigation. Don’t get me wrong. As an expat I know I am supremely lucky here in Dubai to be able to buy almost any ingredient that I want, but in an ideal world I’d swap for less choice but fresher, locally sourced products grown or made with care. 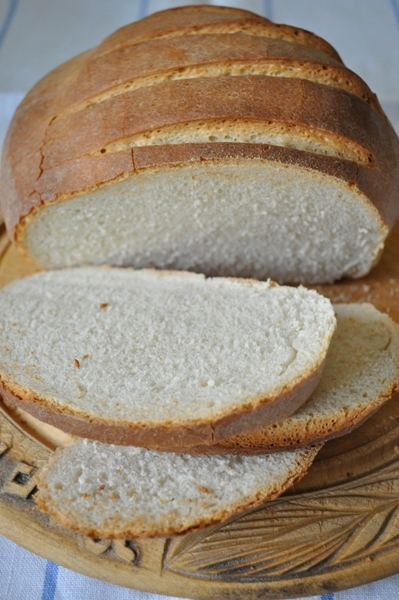 My challenge is to bake something yeasted, using flour where you know either where it was grown or where it was milled. Lets celebrate specific named farmers, farms and millers this month! If I had a magic wand, I would bring the flour ground at Cothele Mill in Cornwall. This is one of my favourite National Trust properties and they have restored the mill (operated by a water wheel) to produce flour. Instant mashed potato granules must be the antithesis of slow food, but when it was launched to the British public in the 1970s the words ‘modern’ and ‘labour-saving’ were very attractive to my parents’ generation; the space programme was in full swing. We had three television channels to choose from and only one was commercial so as children we grew up singing the ad tunes. The Cadbury’s Smash ad (see below) was one of our favourites and still makes me chuckle. However, you can’t get much slower than sour dough and I’ve embarked on the leaven-making process from Dan Lepard‘s The Handmade Loaf. In the meantime we needed bread in less than a few days so I decided to become a Domestic Goddess if only in my imagination and used a Nigella recipe from her eponymous book. 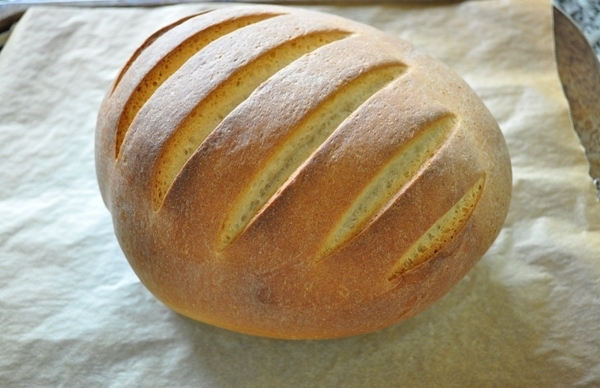 It was a very easy, satisfying loaf to make with a lovely texture. Confession time – I used a couple of tablespoons of Cadbury’s Smash (as La Lawson also suggested) . Click here if you are wondering why I have instant mashed potato flour in my cupboard (that Nigella is a bad influence). If using easy blend or fresh yeast, dissolve it in 200ml of the water. Put the flour and salt (and easy-blend yeast if using) in a large bowl, make a well in the middle and pour in the water. Mix by hand or with a wooden spoon until the dough comes together in a loose mass (Nigella describes as shaggy) – add more water if you need to. Mix in the butter and turn out the dough and knead on a floured surface (or use a machine with a dough hook). Knead for about 10 minutes until the dough is smooth and elastic. Lightly oil the inside of a large bowl, form the dough into a ball and place inside, turning the dough once. Cover with clingfilm and leave to prove in a warm place for about an hour (although it might take 2). The dough should double in size. You can also leave to prove overnight in the fridge. Switch on the oven. Knock back the dough, shape into a round and put on a baking sheet lined with baking parchment (or into a loaf tin), cover loosely with oiled cling film or a tea towel and leave for about 30 minutes until nearly doubled in size again. Slash the top with a blade or extremely sharp knife (if you like) and put in an oven preheated to 220 C. For a good crust, give a few squirts of water from a squeezy bottle into the hot oven. Bake for 35 minutes or until the loaf sounds hollow when you knock with your fist on its base. Leave to cool on a wire rack. And eat with…..unsalted butter or fresh tomatoes or home-made jam or sliced thinly and filled with cucumber or cold roast chicken, rocket and lemon mayonnaise or….well what would you eat with freshly made bread? What a lovely crust you’ve achieved there, Sally! wow that is nice!!! 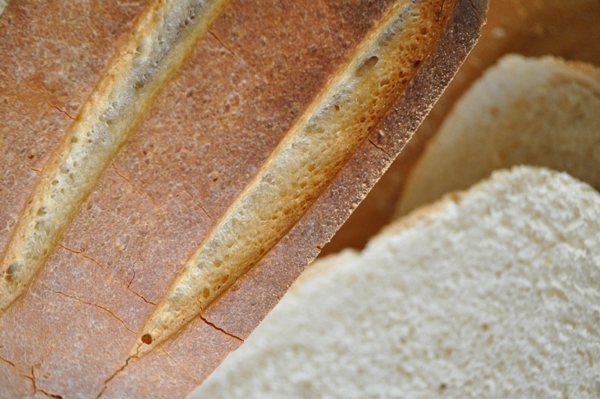 love that bread… and you touch that topic again, local vs the real good stuff. any how there’s al adil incase you want freshly milled stuff. I use their wholewheat flour and they have a nice range of indian flour mixes, including one called diabetes atta (mixture of flours and wholewheat that is friendly to diabetics) i love the rustic flavour of the chapattis i make from this and buy couple of kilos each month. Thanks for sharing this info – I’m going to visit there soon…and making chapattis is another thing on my list. Do you have a good recipe? I understand your frustrating about decent products/produce. Your bread looks absolutely outstanding! And I have to admit to having made those Smash potato cakes too from Nigella Express! Doesn’t get much more processed than that, does it? Hee hee. I love the way you’ve written it! We decided to skip this challenge since there is no organic flour grown here. One could find organic but it comes from Germany, or France, not to mention it’s 5-6 times more expensive. Lately it’s even hard to find Bulgarian fruits and vegetables which amazes me considering the fact that we are an agriculture country. Gosh that seems incredible Silvia – progress isn’t always a good thing. That is a beautiful loaf of bread Sally. It looks every inch the artisan loaf so very well done. This loaf looks absolutely fabulous, I love that Nigella has corrupted you into keeping a stash of Smash in your cupboard!!! I’ve come from Laura’s linky party and just had to say that your bread looks gooooorgeous! I LOVE Nigella Lawson too – smash or no smash!! It’s strange to think of people ever thinking that smash was a good idea as food. Weird. I haven’t tried out this bread recipe yet. It looks like a good ‘un. I have become addicted to the spelt flour from Callington Mill in Tasmania (where I live) which sounds similar to the Cornish Mill you talked about – water wheel operated and very old. They have a bakery attached which makes the most amazing bread (we buy a loaf at our farmers market every week) and their spelt flour is fabulous for baking in muffins and loaves. I found your post fascinating! I had never thought of this challenge of an expat living in the desert. Does food cost a fortune? Good to know about the mill in Cornwall – we’ll be there in a few months and will seek it out. Cothele is lovely – tucked away in a beautiful part of the world. Food in Dubai can be expensive and most is imported (although my friends who moved from Switzerland think it’s really cheap!). Post of the month is a great idea Laura. Thanks for taking part Sally, I will be hot footing it to Cothele on my holidays this year. I hope that with the challenge I have made people think! It was so interesting Helen. I’ve since found out much more about the flours available here including freshly milled from India. Enjoy Cothele – we hire Canadian canoes and go down the River Tamar from Morewhellam Quay ending up near the tea shop for a fabulous cream tea. I just bought strong white bread flour and now I know exactly what to do with it other than make pizza! Wow! That loaf of bread looks perfect… this is something I want to start mastering in my own kitchen this year, would love a slice of this with some ripe homegrown tomatoes, yum!! I had the same concern about the source of food when I was working in China many years ago. Given the unethical ways of some unscrupulous people there, we would always wonder what we would be putting into our mouths – everything from milk to eggs could potentially be tainted. I believe Dubai is much much better. Your loaf looks absolutely perfect! There have been so many recalls over the last year related to food contamination and other chemicals, it’s been quite exhausting to keep track of what you can and cannot eat. The bread looks perfect! So fluffy and uniform, this is the perfect slice for a good sandwich. @Christine @Shirley Dubai actually does tests on all food imported so illegal harmful ingredients don’t make it here (hence them picking up on the toxic herbs too). It’s the legal chemicals I worry about too though – I won’t buy fruit and veg from the US either because apart from the food miles there is no indication whether they are GM crops. I would be worried about Chinese food too Shirley – it must have been difficult to live there for that reason. 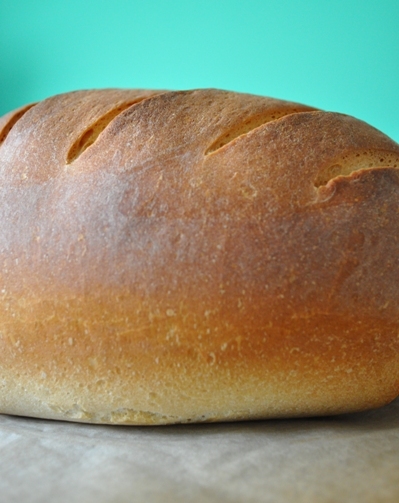 Great post and your bread looks so perfect! I was just in Dubai a couple of weeks ago. Sally, I contend with a lot of the same issues as you. Here in Hong Kong there is very little local food. I wrote a while ago about my milk struggle. There are so many competing values that I find I can’t satisfy: healthy food and low air miles are the two that plague me the most. Sigh. A lot of the flour I buy is whole grain and imported from Europe but I resist all the local ones because they are only white flours. Meat sourced from near here is often full of chemicals and its freshness is questionable; whereas for veggies and fruits there are a lot of pesticides allowed in China that I don’t want to eat. It’s such a balancing act! Any advice would be welcomed…! I’m happy with red meat here – mainly from Australia and New Zealand but try to limit the battery farmed local chicken. My choices are a lot easier than yours in China I think.